My husband on the other hand has painted before and was good about giving me tips. He said to only put about an inch of paint into the pan and to make sure the whole roller has paint on it before painting the wall. Then there was the tip to roll slowly at first to avoid excess paint spraying on things not covered or taped. These were all great tips! The one thing neither of us knew was what kind of paint finish is suggested for different rooms. After slapping two more greens up on the wall there was a clear winner. I seemed to have missed taking a picture of the other two colors we put on the wall. We decided on Benjamin Moore Old Prairie (2143-50). A whole gallon wasn’t necessary for a small bathroom so I was to buy a half gallon (two quarts really since a half gallon wasn’t an option at this particular store). The first Saturday after becoming homeowners my husband was busy taping and prepping the condo to be painted. Therefore I was on go to the store/run errands duty. Off I went to the store feeling really good about what I needed to buy. The man at the store was less than helpful. He started by trying to up-sell me and I got completely confused on what I needed/wanted. Eventually he took my order for the paint and then asked what finish I wanted. I said “ummmm well ….” to which he handed me a finish card to look at. I immediately remembered my friend saying samples come in flat, but get eggshell when you actually paint. Done and done, paint mixed and purchased. 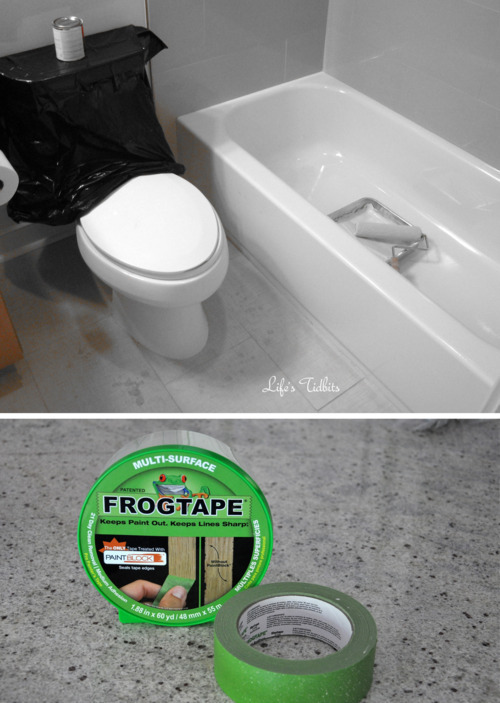 While I was gone my husband taped the bathroom and got it ready to be painted. 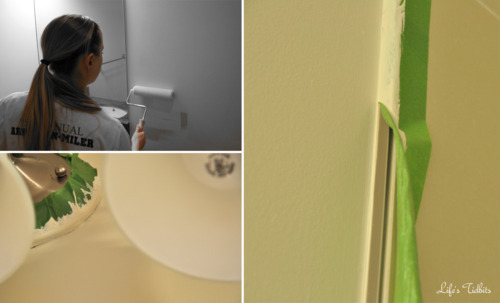 When I got home we painted the bathroom our new light green color. On my next trip that same day to the same paint store to buy paint for the master bedroom, I overheard someone talking about which finish to use for the different rooms. Keep in mind this information wasn’t on the finish card and the guy helping me didn’t offer up any narrative as to what finish to use. As I hear the words bathroom and semi-gloss in the same sentence I start to freak out. Have we just painted the bathroom the with the wrong finish?? When I got back to the new place I shared this tidbit with my husband. Out comes the iphone and Googling begins. Sure enough we painted the bathroom with the wrong finish. We debated if we should spend the money and the time to repaint the bathroom the same color but in semi-gloss or just go with what we already had on the wall. In the end back to the paint store we went to purchase a quart of the semi-gloss. Apparently even a 1/2 gallon was too much paint for the guest bathroom. Since the bathroom was still taped we decided it was best to repaint the room now. Doing it right now would save us the hassle of repainting the room in 6 months if the eggshell wasn’t holding up well. The repainting took less time since there was already a base coat on the walls. In the end I actually liked the look of the semi-gloss better than the eggshell in the bathroom. I’m SOOO glad we took the time (and money) to correct the painting finish error. The husband did a great job on the taping and when we pulled the tap off the lines looked fantastic! 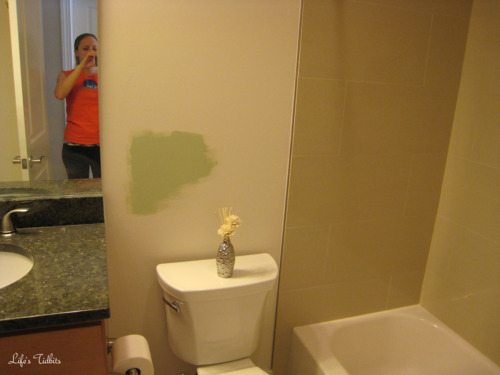 Guest bathroom painting completed … master bedroom, master bathroom and living/dining room as well as hallways to go. Painting is time consuming, but the place is starting to have a more homey feel to it!! Now we just need a shower curtain, mat and accessories and the guest bath will be complete. Have you had any similar painting mishaps? Pingback: Life's Tidbits » Blog Archive » How Many Quarts Did You Buy?